No matter what job you need it for, if you’re in the market for a strong and versatile shackle, a stainless steel bow shackle – safety bolt from Rope Services Direct could be just the thing. All our safety bow shackles are made from ISO 1.4401/4 stainless steel so are great even in harsh weather and marine conditions. This makes them exceptionally hardwearing, and offers a wide variety of uses in sports, mechanics and sailing. They’re ideal when used with one of our many types of wire ropes too. Our safety bow shackles are also proof-tested to double their Working Load Limit (WLL) using machinery which is calibrated to the BS EN 10002-2 and NAMAS NIS 0424 standard. It’s vital that you don’t overload the shackle as you risk distorting or bending it out of shape which will damage its structural integrity. As stainless steel is susceptible to work hardening and stress ageing over time, we highly recommend that you inspect and maintain your shackles regularly. We prioritise offering the best value and service by supplying a large range of safety bow shackles for all sorts of purposes. Whether you choose to secure it to a winch rope or one of our yacht ropes, you’ll almost certainly find the safety bow shackle you need with us. To order your part, please fill out our online enquiry form here. For more information or to speak to a member of our expert team, feel free to contact us on 01384 78004. 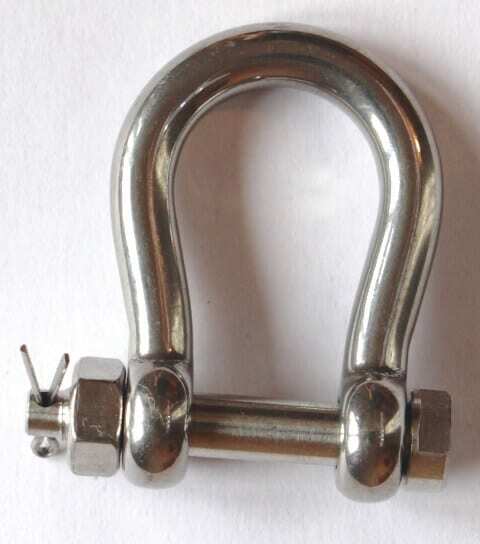 Stainless Steel Bow Shackle - Safety Bolt Overall rating: 5 out of 5 based on 6 reviews.